The investigation found that public officials often commit to buying from Pearson because it’s familiar, even when there’s little proof its products and services are effective. The North Carolina Department of Public Instruction, for instance, declined to seek competitive bids for a new student data system on the grounds that it would be “in the best interest of the public” to simply hire Pearson, which had done similar work for the state in the past. The data system was such a disaster, the department had to pay Pearson millions extra to fix it. The issues are not only on the supply side. Wisconsin’s decade plus use of the weak and largely useless WKCE is worth a deeper dive. Buy side issues merit equal attention. Ms. Simon deserves applause for digging deep. It is so rare in our ever more expensive K-12 world. Fresh from the world of high-stakes trading, David Vitale arrived at Chicago Public Schools a decade ago with a plan to transform the way it borrowed money. With the district thirsty for cheap cash, plain old municipal bonds weren’t good enough anymore, and banks were standing by with attractive new options. So Vitale, then the chief administrative officer at CPS, and other officials pushed forward with an extraordinary gamble. From 2003 through 2007, the district issued $1 billion worth of auction-rate securities, nearly all of it paired with complex derivative contracts called interest-rate swaps, in a bid to lower borrowing costs. A former Union City superintendent took home more than $600,000 last year, making her the top earner on a new online database tracking salary and benefit information for California public school employees. Kari McVeigh, former superintendent of New Haven Unified School District in Union City, and two other superintendents from the Bay Area were among the highest-paid school employees in the state last year in large part because they were fired and received six-figure severance payouts, according to a Chronicle analysis of pay data recently made public by the state Controller’s Office. Every couple of weeks since late September, educators, parents and business leaders have traveled to Jefferson City to participate in work groups tasked with developing standards to replace Common Core. The meetings were scheduled by the Department of Elementary and Secondary Education in two-day clusters during the work week, forcing participants to miss work to attend. Participants aren’t paid. They’re not even reimbursed for their travel, food or lodging. But the controversial department-appointed facilitators and note takers are: $500 per meeting plus “necessary expenses,” department spokeswoman Nancy Bowles said. The Mexican government wisely decided that before the educational system in Mexico could be fixed, they first needed to figure out what they were dealing with. For that reason, EPN ordered the first ever Census of Schools, Teachers and Students of Basic and Special Education (basic meaning primary and middle schools). And this is a gross underestimate, since the states with “the with the most corrupt and backwards systems (Oaxaca, Chiapas, and Guerrero), refused to participate and were not included in the census.” Yikes. Highly educated Americans are choosing cheaper metropolitan centers in the West and South over more dominant—and expensive—population centers on the coasts and former industrial hubs. After flocking to areas with ample employment opportunities such as New York City and Los Angeles for years, the nation’s most educated are fanning out in search of better jobs, lower housing costs and improved quality of life. The 25 U.S. counties with the largest net inflow of people older than 25 with graduate or professional degrees arriving from out of state are nearly all linked to more affordable cities like Raleigh, N.C., and San Antonio, according to an analysis of census data by The Wall Street Journal. Demographers cite several causes for the shift, including soaring property prices in coastal areas, stagnant paychecks and heightened wariness about the increase in debt that is often the price of admission in bigger cities. The proliferation of regional technology hubs in places such as Raleigh also plays a role, while taxes are often lower in parts of the South. Madison is considering a further property tax increase via referendum this fall. The Springfield School District will pay outgoing School Superintendent Walter Milton $177,797 under a separation agreement obtained by The State Journal-Register. Milton’s resignation takes effect March 31, according to the agreement. The 16-page agreement, signed by Milton Jan. 31, was released to The State Journal-Register Tuesday in response to a Freedom of Information Act request. The school district also will continue to pay for Milton’s health and dental insurance until May 31, 2014 unless Milton finds a new job that provides similar benefits, according to the agreement. Milton will receive Illinois Teachers Retirement System credit for about 56 days of unused sick time. Once Milton resigns, the agreement says, a Sept. 28 letter from school board president Susan White will be removed from Milton’s personnel file, as well as his response. The nature of the letter was not disclosed. The State Journal-Register filed FOIA requests for those letters Tuesday. White would not comment on whether Milton’s settlement — to be paid in two installments by May 1 — was taken into consideration when the school board determined budget reductions for next year. Along with a non-disparagement clause, the agreement outlines language to be used in response to inquiries, and it includes Milton’s resignation letter and a recommendation letter to be sent when the school board is asked to provide a reference for Milton. That recommendation letter matches an emailed statement that White sent Feb. 4 to a reporter in Madison, Wis. and to The State Journal-Register. That letter indicated Milton would end his employment with the district March 31. At the time, White said the date was a typographical error. The email prompted The State Journal-Register to submit a series of Freedom of Information Act requests regarding Milton’s employment status. The Milwaukee School Board is once again ignoring Superintendent Gregory Thornton’s request to explore privatizing a portion of the school lunch program. And that’s just another sign that the board is more concerned with saving union food service jobs than with saving money that could be better spent on educating kids. The board and Thornton have been down this road before. In his latest proposal, Thornton asked the board to approve the establishment of a leased commissary. The board voted down the proposal, 5-4, in favor of a central kitchen run by district staff. They would not even consider the possibility of looking at other options to see if those would be more cost effective. In a cash-strapped district, this makes absolutely no sense. The board appears to be against exploring any food service options that would eliminate union jobs. Currently, the food service workforce includes 48 temporary employees and more than 100 part-time employees. Administrators say they have had a hard time filling food service jobs. WITH little fanfare, a dangerous notion has taken hold in progressive policy circles: that the amount of money borrowed by the federal government from Americans to finance its mammoth deficits doesn’t matter. Debt doesn’t matter? Really? That’s the most irresponsible fiscal notion since the tax-cutting mania brought on by the advent of supply-side economics. And it’s particularly problematic right now, as Congress resumes debating whether to extend the payroll-tax reduction or enact other stimulative measures. Here’s the theory, in its most extreme configuration: To the extent that the government sells its debt to Americans (as opposed to foreigners), those obligations will disappear as aging folks who buy those Treasuries die off. Closing the gap between what the campaign proposed and the estimates of the campaign offsets would require scaling back proposals by about $100 billion annually or adding newoffsets totaling the same. Even this, however, would leave an average deficit over the next decade that would be worse than any post-World War II decade. This would be entirely unsustainable and could cause serious economic problems in the both the short run and the long run. Barack Obama has been accused of “class warfare” because he favors closing several tax loopholes — socialism for the wealthy — as part of the deficit-cutting process. This is a curious charge: class warfare seems to be a one-way street in American politics. Over the past 30 years, the superwealthy have waged far more effective warfare against the poor and the middle class, via their tools in Congress, than the other way around. How else can one explain the fact that the oil companies, despite elephantine profits, are still subsidized by the federal government? How else can one explain the fact that hedge-fund managers pay lower tax rates than their file clerks? Or that farm subsidies originally meant for family farmers go to huge corporations that hardly need the help? The idea is, as Newt Gingrich might say, simple liberal social engineering. You take the million or so poorest 3- and 4-year-old children and give them a leg up on socialization and education by providing preschool for them; if it works, it saves money in the long run by producing fewer criminals and welfare recipients — and more productive citizens. Indeed, Head Start did work well in several pilot programs carefully run by professionals in the 1960s. And so it was “taken to scale,” as the wonks say, as part of Lyndon Johnson’s War on Poverty. In a move that qualifies as one of the most ignorant and opportunist positions ever taken by a local politician; the Dumanis Mayoral Campaign announced its “Bold” educational initiative this past Thursday at a press conference. The details of the effort–expanding the school board, creating oversight committees and establishing a bureaucracy within the City government to oversee “liaison” efforts were widely reported in the local news media. Candidate Dumanis got lots of face time on local tv news as her plan was uncritically rolled out to the electorate. Asked about who she worked with in drafting her plan, Dumanis would only say that she’d consulted with an unnamed group of teachers, parents, students and others interested in reform. It’s clear though, that if you look at her list of campaign contributors, the “Bold” plan is largely drawn from the wreckage of the failed San Diegans for Great Schools ballot initiative that, despite receiving over $1 million in donations from a few well heeled “philanthropists”, couldn’t gather enough signatures to be placed in front of the voters. It would be easy to be shocked by The Daily Telegraph’s revelations about exam boards – but the truth is that Britain’s examination system has been heading for a crash for years. The culprit? The process that saw it transformed from a national treasure to a profit-driven industry. Today, examining is not an extension of teaching and learning, but a career in itself – one that has, on occasion, meant acting as little more than an arm of government. The first mistake was to divorce the examination system from its end-users. In the past, academic exam boards were not only named after leading universities, but had a significant number of dons actually marking scripts. Today, the boards’ management structures hardly have any connection with the universities. Control of the content and structure of the examination system needs to be placed firmly in the hands of universities – and, in the case of vocational training, of employers – so they can ensure that students possess the knowledge and skills their bosses or lecturers require, not what is cheapest, most convenient or most politically correct. Changes to policies and procedures over the handling of funds will ensure that nothing like the theft of more than $300,000 from Fort High should occur again, the Rainy River District School Board said following the sentencing last Thursday of former FFHS secretary Fawn Lindberg. “Obviously, there were some shortcomings in terms of oversight, both at the school and right through the board office–and those things hopefully have now all been corrected,” noted board chair Michael Lewis. While Lindberg didn’t have the authority to authorize or sign cheques, it was noted during last Thursday’s court proceedings that a practice had developed whereby blank cheques would be signed in advance by the principal and vice-principal, who did have signing authority. The theft came to light in the fall of 2007 after a deficit of more than $175,000 was noticed by board administration and investigated. In 2008, lawmakers in Springfield cobbled together a $530 million rescue package for Chicago’s transit system, which was on the brink of collapse because of sky-high labor and legacy costs. Just this week they pushed through $300 million of tax credits for the Chicago Mercantile Exchange, Chicago Board Options Exchange and Sears to prevent the businesses from fleeing to lower-tax climes. Both Indiana and Ohio have been aggressively poaching Illinois businesses, especially since January, when lawmakers raised the state income tax to a flat 5% from 3% and the corporate tax to 9.5% from 7.3%. The special carve-outs may stop Sears and the financial exchanges from flying the coop, but the income-tax hikes will still prove job-killers. While the jobless rate in other Midwest states has stayed relatively flat over the past year, Illinois’s unemployment rate has risen to 10.1% from 9%. Most of the lost jobs are in information technology and financial services, which are some of the easiest to move. As a fledgling voice of reform in higher education, Salman Khan is an oddity. He cannot name any higher education accrediting agencies off the top of his head. He advocates for competency-based credentialing, but has never heard of Western Governors University. He is capable of talking on the phone for a full hour without using the word “disruptive” once. Until recently, he was an analyst for a hedge fund. Here is what Khan does know: algebra, statistics, trigonometry, calculus, computer science, biology, chemistry, astronomy, physics, economics, and finance — well enough, at least, to demonstrate the concepts via brief video tutorials on Khan Academy, his free learning website. What began in 2006 as an attempt to tutor his young cousin from afar has evolved into a 2,700-video library with millions of monthly visitors. Many have lauded Khan’s natural skill as a teacher. Khan’s charmingly unpolished home recordings form the public face of the organization and provide a peg for media narratives about online learning and the YouTube-ification of the textbook in an era where the rising prices and demand for higher education has collided with the Internet’s culture of free. In research organizations that have been “captured” by vested interests, the scholars who receive the most attention, praise, and reward are not those who conduct the most accurate or highest quality research, but those who produce results that best advance the interests of the group. Those who produce results that do not advance the interests of the group may be shunned and ostracized, even if their work is well-done and accurate. The prevailing view among the vested interests in education does not oppose all standardized testing; it opposes testing with consequences based on the results that is also “externally administered”–i.e., testing that can be used to make judgments of educators but is out of educators’ direct control. The external entity may be a higher level of government, such as the state in the case of state graduation exams, or a non-governmental entity, such as the College Board or ACT in the case of college entrance exams. One can easily spot the moment vested interests “captured” the National Research Council’s Board on Testing and Assessment (BOTA). BOTA was headed in the 1980s by a scholar with little background or expertise in testing (Wise, 1998). Perhaps not knowing who to trust at first, she put her full faith, and that of the NRC, behind the anti-high-stakes testing point of view that had come to dominate graduate schools of education. Proof of that conversion came when the NRC accepted a challenge from the U.S. Department of Labor to evaluate the predictive validity of the General Aptitude Test Battery (GATB) for use in unemployment centers throughout the country. Teach to the Test? Most of the problems with testing have one surprising source: cheating by school administrators and teachers. The key to the question, of course, is the “rather than”–the assumption by many critics that test preparation and good teaching are mutually exclusive. In their hands, “teach to the test” has become an epithet. The very existence of content standards linked to standardized tests, in this view, narrows the curriculum and restricts the creativity of teachers–which of course it does, in the sense that teachers in standards-based systems cannot organize their instructional time in any fashion they prefer. A more subtle critique is that teaching to the test can be good or bad. If curricula are carefully developed by educators and the test is written with curricula in mind, then teaching to the test means teaching students the knowledge and skills we agree they ought to learn–exactly what our teachers are legally and ethically obligated to do. Citing a critical need to not underestimate the stakes at hand, Commissioner of Education Chris Nicastro presented to the State Board of Education today her analysis of ways the state could assist the Kansas City Public Schools in regaining accreditation. The State Board met in Branson on Dec. 1-2, where discussion of the Kansas City Public Schools was part of the Department of Elementary and Secondary Education’s recommendation for revamping a statewide system of support. This system would identify risk factors and target limited resources to assist unaccredited school districts and those that are at risk of becoming unaccredited. Currently, nearly one dozen schools would receive focused attention. Budget/Financing, Community Partners, Curriculum, Curriculum - Math, Governance/Board Decision Making, History - Madison Schools, Parenting, School Climate, Staff Support, Student Support, TAG, Teacher Support, Waste, What Can I Do? Madison schools aren’t failing, by any stretch of the imagination, for many students. In fact, if you’re a white, middle-class family sending your children to public school here, your kids are likely getting an education that’s on a par with Singapore or Finland — among the best in the world. However, if you’re black or Latino and poor, it’s an unquestionable fact that Madison schools don’t as good a job helping you with your grade-point average, high school graduation, college readiness or test scores. By all these measures, the district’s achievement gap between white and minority students is awful. These facts have informed the stern (and legitimate) criticisms leveled by Urban League President Kaleem Caire and Madison Prep backers. But they doesn’t take into account some recent glimmers of hope that shouldn’t be discounted or overlooked. Programs like AVID/TOPS support first-generation college-bound students in Madison public schools and are showing some successes. Four-year-old kindergarten is likely to even the playing field for the district’s youngest students, giving them a leg up as they enter school. And, the data surrounding increasing numbers of kids of color participating in Advanced Placement classes is encouraging. Stepping back from the local district and looking at education through a broader lens, it’s easy to see that No Child Left Behind and Race to the Top have aimed to legislate, bribe and punish their way toward an unrealistic Lake Wobegon world where all the students are above average. Remarkable. Are there some excellent teachers in Madison? Certainly. Does Madison’s Administration seek best in the world results? A look at the math task force, seemingly on hold for years, is informative. The long one size fits all battle and the talented and gifted complaint are worth contemplating. Could Madison be the best? Certainly. The infrastructure is present, from current spending of $14,963/student to the nearby UW-Madison, Madison College and Edgewood College backed by a supportive community. Ideally, Madison (and Wisconsin) should have the courage to participate in global examinations (Florida Students Take Global Examinations, Wisconsin’s Don’t). 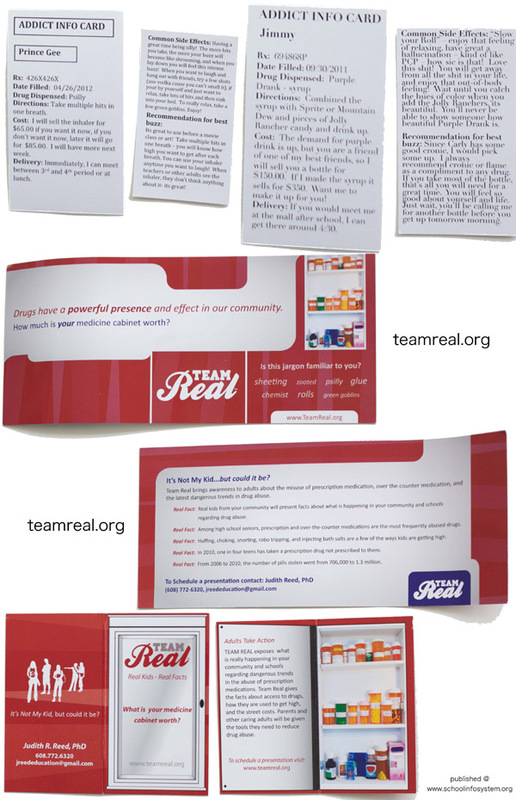 Taxpayers and parents would then know if Troller’s assertions are fact based. After more than two years under state control, Detroit’s public school district appears to be getting its basic finances in order by privatizing services, cutting wages, restructuring debt and aggressively seeking out students to fill its classrooms. The district’s operating deficit stands at $83 million, down from $327 million at the start of the year, according to documents released by the district Monday. The progress under the district’s new state-appointed emergency financial manager could offer a roadmap for the city of Detroit, which is running out of cash and may itself fall into state hands. Newt Gingrich has some unconventional ideas about education reform. He wants every state to open a work-study college where students work 20 hours a week during the school year and full-time in the summer and then graduate debt-free. In poverty stricken K-12 districts, Mr. Gingrich said that schools should enlist students as young as 9 to14 to mop hallways and bathrooms, and pay them a wage. Currently child-labor laws and unions keep poor students from bootstrapping their way into middle class, Mr. Gingrich said. “This is something that no liberal wants to deal with,” he told an audience at the John F. Kennedy School of Government at Harvard on Friday, according to Politico. A Dane County judge on Monday ordered the Madison School District to turn over more than 1,000 sick notes submitted by teachers who didn’t come to work in February during mass protests over collective bargaining. Dane County Circuit Judge Juan Colas said the district violated the state’s Open Records Law by issuing a blanket denial to a request for the notes from the Wisconsin State Journal rather than reviewing each note individually. Under the records law, government agencies must make public the records they maintain in most circumstances. State Journal editor John Smalley said the court ruling was a victory for open records and government accountability. He said the newspaper was not planning to publish individual teacher names but rather report on the general nature of the sick notes the district received from employees. Late last week I got an email from Kaleem Caire, Urban League CEO and champion of the Madison Preparatory Academy charter school proposal. Caire was unhappy with the way I had characterized the latest version of the charter school proposal. In his message, Caire asked me, and my fellow reporter, Matt DeFour from the Wisconsin State Journal, to correct our descriptions of the proposed school, which will be approved or denied by the Madison School Board in the coming weeks. I wonder if other Madison School District programs, many spending far larger sums, receive similar substantive scrutiny compared with the proposed Madison Preparatory Academy IB charter school? The District’s math (related math task force) and reading programs come to mind. Ideally, the local media might dig into curricular performance across the spectrum, over time along with related expenditures and staffing. From a governance perspective, it is clear that other regions and states have set the bar much higher. Related: Updating the 2009 Scholastic Bowl Longhorns 17 – Badgers 1; Thrive’s “Advance Now Competitive Assessment Report”. In my view, the widely used (at least around the world) IB approach is a good start for Madison Prep. For years, this veteran teacher had received exemplary evaluations but now was feeling pressured to raise her students’ test scores. Her principal criticized her teaching and would show up to take notes on her class. She knew the material would be used against her one day. “My principal told me right to my face that she — she was feeling sorry for me because I don’t know how to teach,” the instructor said. The Los Angeles educator, who did not want to be identified, is one of about three dozen in the state accused this year of cheating, lesser misconduct or mistakes on standardized achievement tests. On Sept. 28, 2011, a PDC complaint was filed with the Public Disclosure Commission because of concerns noted in multiple public records from Spokane Public Schools. This PDC complaint is about Washington State’s RCW 42.17.130. Budget/Financing, Community Partners, Curriculum, Elections, Governance/Board Decision Making, History - Madison Schools, Parenting, School Climate, Staff Support, Student Support, Teacher Support, Waste, What Can I Do? Address the fundamental teaching and learning needs of schools in the Local Education Agency (LEA), especially the academic problems o f low-achieving students. MMSD has been identified by the State of Wisconsin as a District Identified for Improvement, or DIFI. We entered into this status based on District WKCE assessment scores. The data indicates that sub-groups of students-African American students, English Language Learner Students with Disabilities or Economically Disadvantaged -did not score high enough on the WKCE in one or more areas of reading, math or test participation to meet state criteria. The Measures of Academic Progress (MAP): Grades 3-7. MAP is incorporated into the MMSD Balanced Assessment Plan as a computer adaptive benchmark assessment tool for grades 3-7. Administration of the assessment was implemented in spring, 2011. Cognitive Ability Test (CogAT): Grades 2 and 5. As proposed in the Talented and Gifted Plan approved by the Board of Education in August, 2009, the district requested approval of funds to purchase and score the Cognitive Ability Test (CogAT) which was administered in February, 2011, to all second and fifth graders. The EPAS System: Explore Grades 8-9, Plan Grade 10, ACT Grade 11. The EPAS system provides a longitudinal, systematic approach to educational and career planning, assessment, instructional support, and evaluation. The system focuses on the integrated, higher-order thinking skills students develop in grades K-12 that are important for success both during and after high school. The EPAS system is linked to the College and Career Readiness standards so that the information gained about student performance can be used to inform instruction around those standards. Attached are six documents describing programs being implemented for the 2011-12 school year to address the needs of all students. Madison School District administrators aren’t keeping track of the best classroom instruction. Not all principals create a culture of high expectations for all students. And teachers aren’t using the same research-based methods. Such inconsistencies across the district and within schools — stemming from Madison’s tradition of school and teacher autonomy — are hurting student achievement, according to a district analysis required under the federal No Child Left Behind law. Inconsistencies in teaching and building culture can affect low-income students, who are more likely to move from school to school, and make teacher training less effective, Nerad said. The analysis is contained in an improvement plan the district is scheduled to discuss with the School Board on Monday and to deliver next week to the state Department of Public Instruction. Student loans in America Nope, just debt The next big credit bubble? IN LATE 1965, President Lyndon Johnson stood in the modest gymnasium of what had once been the tiny teaching college he attended in Texas and announced a programme to promote education. It was an initiative that exemplified the “Great Society” agenda of his administration: social advancement financed by a little hard cash, lots of leverage and potentially vast implicit government commitments. Those commitments are now coming due. Budget/Financing, Community Partners, Curriculum, Governance/Board Decision Making, Legal Rights, Lifelong Learning, Parenting, School Climate, Staff Support, Student Support, Teacher Support, Waste, What Can I Do? Earlier this year, Dropout Nation argued that one way that school reformers — including school choice activists and Parent Power groups — could advance reform and expand school choice was to file lawsuits similar to school funding torts filed for the past four decades by school funding advocates. But now, it looks like Parent Power activists may be filing a lawsuit in Los Angeles on a different front: Overhauling teacher evaluations. And the Los Angeles Unified School District may be the place where the first suit is filed. In a letter sent on behalf of some families Wednesday to L.A. Unified Superintendent John Deasy and the school board — and just before the district begins negotiations with the American Federation of Teachers’ City of Angels unit over a new contract — Barnes & Thornburg’s Kyle Kirwan demanded that the district “implement a comprehensive system” of evaluating teachers that ties “pupil progress” data to teacher evaluations. Kirwan and the group he represents are also asking for the district to begin evaluating all teachers “regardless of tenure status” and to reject any contract with the American Federation of Teachers local that allows for any veteran teacher with more than a decade on the job to go longer than two years without an evaluation if they haven’t had one in the first place. We represent minor-students currently residing within the boundaries of the Los Angeles Unified School District (the “District” or “LAUSD”), the parents of these students, and other adults who have paid taxes for a school system that has chronically failed to comply with California law. Our clients seek to have the District immediately meet its obligations under the Stull Act, a forty year old law that is codified at California Education Code section 44660 et seq. (the “Stull Act“). Cal. Educ. Code § 44662(a). The Stull Act requires further that “[t]he governing board of each school district … evaluate and assess certificated employee performance as it reasonably relates to … [t]he progress of pupils toward the standards established pursuant to subdivision (a) and, if applicable, the state adopted academic content standards as measured by state adopted criterion referenced assessments ….” Cal. Educ. Code§ 44662(b)(l). In the forty years since the California Legislature passed the Stull Act, the District has never evaluated its certificated personnel based upon the progress of pupils towards the standards established pursuant to Education Code section 44662(a) and, if applicable, the state adopted academic content standards as measured by the state adopted criterion referenced assessments; never reduced such evaluations to writing or added the evaluations to part of the permanent records of its certificated personnel; never reviewed with its certificated personnel the results of pupil progress as they relate to Stull Act evaluations; and never made specific recommendations on how certificated personnel with unsatisfactory ratings could improve their performance in order to achieve a higher level of pupil progress toward meeting established standards of expected pupil achievement. The Seattle Times has made their perspective clear: they support the current school board. Not only did they endorse the incumbents in the upcoming election, they have gone out of their way to claim that the Board is not to blame for the recent scandals. They write that the Board has learned from those mistakes – not that they made any mistakes – and will do better now – not they they hadn’t done well enough before. The Times would have us believe that the Board isn’t to blame, but that the system is to blame – nevermind that the Board controls the system. Budget/Financing, Community Partners, Elections, Governance/Board Decision Making, School Climate, Waste, What Can I Do? On Oct. 24, a Spokesman-Review reporter called me to talk about education. Over five years of education advocacy, this was the second phone call I’ve received from a SR reporter. The first call came Oct. 13, after I submitted a Letter to the Editor about the formal complaint I filed Sept. 28 with the Public Disclosure Commission (PDC). This PDC complaint concerns Spokane Public Schools and school board candidate Deana Brower. Reporter Jody Lawrence-Turner called me to ask for a copy of the complaint. On Monday, Lawrence-Turner called again as I was driving home with my daughter and a student I’m tutoring. Before I talked with Lawrence-Turner, I confirmed that we were having a conversation that was NOT on the record. Having confirmed that, I talked with her about various education-related topics. If Lawrence-Turner wonders why I asked if our conversation was off the record, all she needs to do is look at her articles. Gee, do you think The Spokesman-Review and Lawrence-Turner want Brower to win the school board election? I offered my entire blog to Lawrence-Turner, the information in it, and the links to district emails – and this is what she wrote. It looks to me like yet another slanted article with unsupported insinuations regarding school board candidate Sally Fullmer and a local community member, and with an accompanying free pass for opponent Brower. Most area schools will be closed Thursday and Friday, but with the annual teachers union convention canceled districts are considering whether to do away with the mid-semester break in the future. Many school districts had already set their calendars for this year by the time the Wisconsin Education Association Council announced in May it would cancel its fall convention. But Sun Prairie and McFarland have decided to hold classes next year on the days previously set aside for the WEAC convention. Others, including Cambridge, Belleville and DeForest, are thinking about doing the same. ON the night of Sept. 8, Gina M. Raimondo, a financier by trade, rolled up here with news no one wanted to hear: Rhode Island, she declared, was going broke. Maybe not today, and maybe not tomorrow. But if current trends held, Ms. Raimondo warned, the Ocean State would soon look like Athens on the Narragansett: undersized and overextended. Its economy would wither. Jobs would vanish. The state would be hollowed out. It is not the sort of message you might expect from Ms. Raimondo, a proud daughter of Providence, a successful venture capitalist and, not least, the current general treasurer of Rhode Island. But it is a message worth hearing. The smallest state in the union, it turns out, has a very big debt problem. SPRINGFIELD —- Two lobbyists with no prior teaching experience were allowed to count their years as union employees toward a state teacher pension once they served a single day of subbing in 2007, a Tribune/WGN-TV investigation has found. Madison Schools Superintendent Dan Nerad publicly touted President Barack Obama’s stalled jobs proposal Monday, saying it would help the School District pay for millions of dollars in needed maintenance projects. “We either pay now, or we pay more at a much later date,” Nerad said at a press conference at West High School, which is due for about $17.4 million in maintenance projects over the next five years. A School Board committee is reviewing maintenance projects identified in a 2010 study by Durrant Engineers that said the district may need to spend as much as $83.7 million over five years on projects not already included in the budget. The committee is expected to make recommendations early next year. Nerad said the committee hasn’t decided yet whether to recommend another maintenance referendum. A 2004 referendum authorizing $20 million over five years ran out last year. The most recent Madison School District maintenance referendum spending has come under scrutiny – though I’ve not seen any further discussion on this topic over the past year. Well, the tools the governor gave local school districts are the right to force teachers to pay more toward their retirement, and the option to unilaterally require educators to kick in more for their health care. The problem is that the tools, along with any money some of them might have left over from federal jobs funds, are one-time solutions. These tools can’t be used again unless school districts ask teachers to give up even more of their take-home pay. By law, all school districts have to balance their budgets. They always have, and always will. That’s not the point. The point is that the governor has hijacked the language. Educational accountability isn’t about balancing the budget, it’s about giving kids opportunities to grow up into good, contributing adults. That’s not what Gov. Walker wants to talk about. The red line, here, is median real household income, as gleaned from the CPS, indexed to January 2000=100. It’s now at 89.4, which means that real incomes are more than 10% lower today than they were over a decade ago. More striking still is the huge erosion in incomes over the course of the supposed “recovery” — the most recent two years, since the Great Recession ended. From January 2000 through the end of the recession, household incomes fluctuated, but basically stayed in a band within 2 percentage points either side of the 98 level. Once it had fallen to 96 when the recession ended, it would have been reasonable to assume some mean reversion at that point — that with the recovery it would fight its way back up towards 98 or even 100. Instead, it fell off a cliff, and is now below 90. Public education needs more money! Public education needs more money! One of these statements (had Paul Revere actually said it) was true. One of these statements is obviously false. And the third, well, skies don’t fall, silly. Taxpayers keep hearing how the funding for public education has been cut. We’re constantly barraged with: “Money is tight.” “We’ve cut the budget to the bone.” “We’re running out of options.” “We’ve done all we can; now we have to cut programs and teachers.” These claims defy explanation. They aren’t true in Spokane. They aren’t true in Washington State. They aren’t true in most other states, and they aren’t true at the federal level. Unfortunately, many people believe them. A city council candidate insisted recently: “We can’t gut education!” Last week, a Spokane reporter wrote: “Since 2002, Spokane Public Schools has cut $45 million from its budget…” In its budget forums last spring, district administrators and board directors told the public that since 2002, the district has cut $54 million from its budget. Spokane school board candidate Deana Brower has repeatedly said that the district needs more money. Let’s look at some numbers. Follow the links to the budget documents. See how the budget has grown, and see the district’s tendency to budget for greater expenditures than it has in revenues. Get ready law schools: A Senate hearing on the ABA regulation of law schools might be coming. That is the subtext of Senator Boxer’s most recent letter to the ABA. It’s overdue. Law schools have demonstrated time and again that we are incapable of regulating ourselves. It started a century ago, when AALS and ABA wrote accreditation standards to keep out competition from lower cost urban law schools that educated immigrants and working class people. It was on display in 1995, when the Department of Justice filed a civil antitrust suit against the ABA, charging that legal educators had captured the accreditation process and were using it to ratchet up their wages and reduce their teaching loads. And it is happening again now–as highlighted by two recent examples. The struggling Kansas City, Missouri School District was stripped of its accreditation on Tuesday, raising the possibility of student departures and a state takeover. The action follows weeks of tumult that included another round of turnover of top leadership. Though not entirely unexpected, the move was a painful return to reality for the city after a period of optimism that difficult choices were finally being made to confront longstanding problems in the school district, most notably the closing of nearly half the schools in response to a huge budget deficit. The Missouri Board of Education cited the continued failure to improve academic performance and the continued instability in district leadership as driving its decision. The district has been provisionally accredited for nearly a decade after a two-year period during which it was unaccredited. Former Madison School District Superintendent Art Rainwater formerly worked for the Kansas City School District. The great schools revolution Education remains the trickiest part of attempts to reform the public sector. But as ever more countries embark on it, some vital lessons are beginning to be learned. Money & School Performance is well worth a read. It is a rare organization that can reinvent itself, rather than continuing to atrophy. Four labor unions spent $4.2 million in the first half of 2011 lobbying state lawmakers, according to a report from the Government Accountability Board. Overall, lobbying organizations reported spending $23.9 million, a 15 percent increase over the first six months of the 2009-2010 legislative session. The first-half 2011 report analyzes the activities of 707 lobbying principals and 725 registered lobbyists. At first glance, the ongoing lawsuit between the Wisconsin Interscholastic Athletic Association and Gannett Newspapers might seem like the Iran-Iraq War, or a Bears-Vikings game — fans of neither side might wonder if both could lose. Internet blogs, forums, tweets and other text depictions or references are permitted and are not subject to rights fees unless they qualify as play-by-play (see definition below) or are not in compliance with the media policies of the WIAA. Play-by-play accounts of WIAA Tournament Series events via text are subject to text transmission rights fees. But when it comes to sick time for teachers who work around lots of kids known for having lots of germs, Forbes has cautioned districts to tread lightly and not make big changes if it’s not necessary to balance the budget. The school districts of Hamilton and Elmbrook in Waukesha County both have modified their sick-time policies. Hamilton educators used to have about 20 sick days per year, and the new policy cuts that approximately in half, said Denise Dorn Lindberg, spokeswoman for the district. Hamilton’s teaching staff members used to be able to accrue a maximum of 75 sick days over the course of their career; the new maximum is 30 days – time that can be used to cover extended recovery from illness or injury. But while the bank of days went down, it’s also been restructured to act more like a portable benefit, Lindberg said. For example, any unused leave acquired beyond 30 days can be converted to $125 per day and deposited in a teacher’s retirement account. AFTER a summer of budget cuts in Washington and state capitals, we have only to look to our schools, when classes begin in the next few weeks, to see who will pay the price. The minimum required school day in West Virginia is already about the length of a “Harry Potter” double feature. In Los Angeles, Philadelphia and Milwaukee, summer school programs are being slashed or eliminated. In Oregon and California this year, students will spend fewer days in the classroom; in rural communities from New Mexico to Idaho, some students will be in school only four days a week. For all the talk about balancing the budget for the sake of our children, keeping classrooms closed is a perverse way of giving them a brighter future. What are the odds that your friend makes something innovative? Not good. After all, you’ve practically defined the solution by specifying nearly all of its inputs before she can even consider what she might cook. A far better way to generate an innovative solution is to define the outcome you need — a five-course meal for eight — and then allow your friend to figure out the best way to get there. On the pages of Time, Andrew Rotherham examines the various reform-minded groups that have sprung up within the ranks of the big-city teachers’ unions. Sarah Rosenberg at The Quick and the Ed follows suit. Rotherham calls them “insurgents” while Rosenberg refers to “a revolution.” While I applaud any publicly stated diversity of thought within NEA and AFT, I am considerably less sanguine about the prospects of major internal reform. There are two problems. One is that in any corporate culture radical changes in direction are frowned upon, if not suppressed. In unions, whose very hallmark is solidarity, this reluctance to entertain unorthodox thought is ratcheted up several levels. The relative electoral success of NewTLA is remarkable, but such victories don’t usually result in further gains in subsequent elections. I admit we are operating in extraordinary times, so maybe things will be different and I’ll be surprised. When Luis Mario Rojas was fired from the Elizabeth Board of Education in 2006, he claimed he had been the victim of a political purge. In a federal lawsuit, Rojas said that while district officials cited a poor work record and budget cutbacks, the real reason for his termination after nearly 20 years on the job was that he became viewed as a disloyal soldier. His sister, former board member Oneida Duran, had a falling out with those in control of the school district. Earlier this year, board members agreed to resolve the matter. They gave Rojas $68,997 to settle his complaint. In addition, they paid out another $24,652 to settle a separate workers’ compensation case. Then they put him back on the payroll — paying him $60,064 annually until he becomes eligible for retirement in two years. As part of the agreement, he promised never to say a word about it. With the practice of paying forced union dues soon to become a relic of the past for many public employees, officials of the Wisconsin Education Association Council have reportedly contacted members in a bid to convince them to continue paying up through automatic bank withdrawals. That’s not surprising because the revenue stream the state’s largest teachers’ union is trying to protect is substantial. In fact, the organization collected more than $23.4 million in membership dues in fiscal year 2009 from its approximately 98,000 members. The numbers are included on WEAC’s IRS forms for the year. Fiscal year 2009 was the latest filing available. The state’s new collective bargaining law that took effect this week will end mandatory dues payments and government collection of dues for many public employees immediately and for most of the rest when current contracts expire. According to IRS documents, the union mustered membership dues of $23,458,810 in fiscal year 2009. National Education Association revenue totaled another $1,419,819, while all revenues totaled $25,480,973, including investment income of $367,482. IT IS not exactly unusual for children to cheat at school. But Indonesians have learned recently that their teachers add a new twist to a familiar tale: ordering their own pupils to cheat, even if they do not want to. Not surprisingly, the revelation has led to an anxious debate about whether anyone can trust the grades of millions of young men and women who come onto the labour market each year in South-East Asia’s biggest economy. The scandal came to light at the beginning of June when the mother of a 13-year-old boy in Surabaya, in eastern Java, told the local media that her son had been forced by his teachers to share his answers to a national exam with his classmates. The mother, Siami, first complained to the school but was ignored. So she took her story to a local radio station. Budget/Financing, Curriculum, Events, Governance/Board Decision Making, School Climate, Staff Support, Student Support, Teacher Support, Waste, What Can I Do? State investigators have uncovered a decade of systemic cheating in the Atlanta Public Schools and conclude that Superintendent Beverly Hall knew or should have known about it, The Atlanta Journal-Constitution has learned. In a report that Gov. Nathan Deal planned to release today, the investigators name nearly 180 educators, including more than three dozen principals, as participants in cheating on state curriculum tests, officials said over the weekend. The investigators obtained scores of confessions. The findings suggest the national accolades that Hall and the school system have collected — and the much-vaunted academic progress for which she claimed credit — were based on falsehoods. Raising test scores apparently became a higher priority than conducting the district’s business in an ethical manner. Details are beginning to tumble out from a 428-page report by state investigators on alleged cheating in Atlanta Public Schools. On Tuesday, Gov. Nathan Deal released only a two-page summary of the report showing organized, systemic cheating in Atlantic Public Schools by scores of educators, including 38 principals. Deal says “there will be consequences” for educators who cheated and has forwarded the findings to three district attorneys as well as state and city education officials. GWEN IFILL: Now, an exhaustive new report reveals nearly 200 educators cheated to boost student test scores in Atlanta, a problem that has surfaced in school districts across the country. The Georgia investigation commissioned by Gov. Nathan Deal found, results were altered on state curriculum tests by district administrators, principals and teachers for as long as a decade. Educators literally erased and corrected students’ mistakes to make sure schools met state-imposed testing standards. And it found evidence of cheating in 44 of the 56 schools examined for the 2009 school year. That Sunday rally in Capitol Square was just the first step in the massive protests against Gov. Scott Walker’s infamous “budget repair bill.” The Madison teachers’ union declared a “work action” and that Wednesday, instead of going to school, we marched into the Capitol building, filling every nook and cranny. The excitement mounted day by day that week, as teachers from throughout the state were joined by students, parents, union and nonunion workers in the occupation and demonstrations. ￼￼Madison teachers stayed out for four days. It was four exhilarating days, four confusing days, four stressful and exhausting days. The U.S. Department of Justice on Tuesday approved a new law that gives Gov. Nathan Deal the power to suspend the entire Atlanta school board for jeopardizing the city district’s accreditation. With that consent, state school board members will hold a hearing that involves the local nine-member board no later than July 31. They will then make a recommendation to the governor. Deal does not have to follow the state board’s recommendation. But if he suspends local members, Deal will make interim appointments and ousted board members will be allowed to appeal for reinstatement. So we’ve got all these empty school buildings in Milwaukee at the same time we’ve got schools or potential schools that need decent buildings. Resolving this doesn’t sound like the most complicated issue facing the human race. Almost needless to say, it’s complicated. For quite a while, there was not much action on the empty-school front. Now, there’s a lot, including plans being developed on two different (and potentially competing) tracks. Making maximum use of these assets will take cooperation between leaders of Milwaukee Public Schools and non-MPS schools, who are not known for cooperating across turf lines. But there is some chance that at least hunks of the empty-school issue will be worked out cooperatively and to the actual benefit of school kids. In fact, a major example of that is unfolding without public controversy right now. School Board members last week were given a list of 29 properties owned by MPS that were considered “surplus.” Several of them are not schools. Several currently are being leased or used in some way. When you boil it all down, there are maybe a dozen that seem to be good candidates to be used as schools. With green lights being given by the state Legislature to open more charter schools (independent or semi-independent, nonreligious, publicly funded schools) and private schools in the publicly funded voucher program, more people are eyeing empty MPS buildings. Getting use of them could save millions of dollars, compared with the alternatives. Budget/Financing, Community Partners, Governance/Board Decision Making, School Climate, Waste, What Can I Do? You’ve probably heard the Compton Parent Trigger story by now: over 200 parents grew tired of seeing their kids drop out and fail to learn to read at one of the chronically, lowest performing schools in California. So they banded together to use the historic new Parent Trigger Law (which I authored), only to face an all-out assault by the Compton Unified School District against their efforts to create a better future for their children. What these parents are doing invokes the spirit of Mendez, a 1946 federal court case that challenged racial segregation in Orange County schools. In its ruling, the United States Court of Appeals for the Ninth Circuit, in an en banc decision, held that the segregation of Mexican and Mexican American students into separate “Mexican schools” was unconstitutional. Likewise, in the landmark case of Brown v. Board of Education the United States Supreme Court declared state laws establishing separate public schools for black and white students unconstitutional. This is our district and how it operates even during hard times. The Superintendent jumped in and said that they gave bumps to people who got promotions. I had specifically said in my question to the Mayor that these were not for people with promotions and/or additional job responsibilities and I said that again. She then said that they had found that they hadn’t been paying people what they should and gave them raises. You can imagine how that went over in the room. Paying administrative people what they are worth in a poor economy in a district that says it has no money. It is not the fault of those people to ask for the money but it is wrong for the district to pay them more now. There’s no amount of waffling that can change that. The worst of Detroit’s schools will be pulled out of the district–which the nation’s top education official calls the “bottom of the barrel”–and placed in a new system that gives principals and staff more control over spending, hiring and improvement efforts, state officials announced Monday. The overhaul is meant to help address problems in a debt-plagued district where nearly one in five students drops out. While the Detroit Public Schools has had a state-appointed emergency financial manager for two years, the current one said there’s only so much that can be done without more radical change. “The system is broke and I can’t fix it, and you can’t fix it,” Roy Roberts said at a news conference where he and the governor announced the plan. As many as 45 schools could be moved to the new system in the fall of 2012. Principals will be in charge of hiring teachers, and they and their staffs will handle day-to-day operations. To compile the 2011 list of the top high schools in America, NEWSWEEK reached out to administrators, principals, guidance counselors, and Advanced Placement/International Baccalaureate coordinators at more than 10,000 public high schools across the country. In order to be considered for our list, each school had to complete a survey requesting specific data from the 2009-2010 academic year. In total, more than 1,100 schools were assessed to produce the final list of the top 500 high schools. Four-year, on-time graduation rate (25%): Based on the standards set forth by the National Governors Association, this is calculated by dividing the number of graduates in 2010 by the number of 9th graders 2006 plus transfers in minus transfers out. Unlike other formulas, this does not count students who took longer than four years to complete high school. Percent of 2010 graduates who enrolled immediately in college (25%): This metric excludes students who did not enroll due to lack of acceptance or gap year. AP/IB/AICE tests per graduate (25%): This metric is designed to measure the degree to which each school is challenging its students with college-level examinations. It consists of the total number of AP, IB, and AICE tests given in 2010, divided by the number of graduating seniors in order to normalize by school size. AP exams taken by students who also took an IB exam in the same subject area were subtracted from the total. AP/IB/AICE courses offered per graduate (5%): This metric assesses the depth of college-level curriculum offered. The number of courses was divided by the number of graduates in order to normalize by school size. 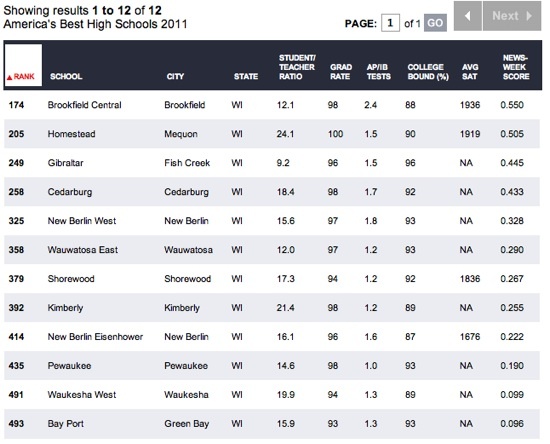 Just 12 Wisconsin high schools made the list, not one from Dane County. It would be interesting to compare per student spending (Madison spends about $14,476 per student) , particularly in light of a significant number of “southern” high schools in the top 50. Much more on United States per student spending, here. Wisconsin State Tax Based K-12 Spending Growth Far Exceeds University Funding. Responding to the latest in a series of consulting scandals that have plagued the Department of Education in recent years, Manhattan Borough President Scott Stringer — who was joined by UFT President Michael Mulgrew at a press conference at the Manhattan Municipal Building — called for a freeze on all new, nonessential DOE consulting contracts. Declaring consulting “the new political patronage of our time,” the two leaders also called for a “top-to-bottom” probe of all existing DOE contracts. Mulgrew said revelations of the DOE financial scandals were especially disheartening at a time when the mayor is pushing to lay off more than 4,200 teachers on the grounds that the city can no longer afford to pay them. It’s a familiar story told too many times, and it has a tragic end. An unmarried girl secretly gives birth. She is alone; one helpless child burdened with another. In this tale, it is the innocent who perishes, at the hands of the ignorant – a teenage mother. Budget/Financing, Community Partners, Events, Governance/Board Decision Making, History - Madison Schools, Legal Rights, Lifelong Learning, School Climate, Staff Support, Student Support, Teacher Support, Waste, What Can I Do? The Madison School District failed to follow state law when it denied the Wisconsin State Journal access to more than 1,000 sick notes submitted by teachers who didn’t show up for work in February, according to a lawsuit filed by the newspaper Thursday. The lawsuit, filed in Dane County District Court, asks the court to force the district to release the notes under the state’s open records law, which requires government agencies to release public documents in most circumstances. The lawsuit says the sick notes are public records because the public has a special interest in knowing how governments discipline employees, who are ultimately responsible to the public. “We can’t know if things were dealt with appropriately if we can’t see the underlying documents on which decisions were made,” said April Rockstead Barker, the newspaper’s lawyer. Dylan Pauly, a School District lawyer, declined comment until she had a chance to review the lawsuit. That’s it. There is no magic. And the federal takeovers, the jazzy new technology, Bill Gates’ money, the data-gathering, reform, transformation, national initiatives, removal of teacher seniority, blaming of parents, hand-wringing in the media, and budget shifting won’t change that simple fact. State College Area School District in Pennsylvania several years ago abandoned plans to build a new high school. This month, it received a notice that it owes $10 million to Royal Bank of Canada for skipping an interest payment on money it never borrowed for a school it didn’t build. The notice was the latest step in a legal battle over what the district calls a “naked swap” and what RBC describes as a binding legal agreement. The conflict is an example of how cities, states, schools and other public entities are second-guessing financial deals they made in recent years, pitting them against their own bankers and advisers. Many of the regrets revolve around interest-rate swaps that became popular as a way for municipal borrowers to guard against jumps in rates. Typically under these contracts, a borrower pays a bank interest with a fixed rate and the bank pays interest with a floating rate in return. When interest rates declined, swaps proved costly to many borrowers. School districts across the state are being asked to release the names of teachers who called in sick during protests in February at the Capitol, a move that led to closures for a day or more in many districts. It’s unclear how many of the state’s 424 districts received requests, but several conservative groups have made public records requests for teacher names. Most districts have released them. But the Madison School District denied several requests, saying the release could risk the safety of teachers and students, and disrupt morale and the learning environment in schools. And the s, the state’s largest teachers union, used a similar argument in asking a La Crosse County judge to quash the release of teacher names in the La Crosse and Holmen districts. The judge recently blocked the release of names in Holmen and may rule soon on the La Crosse case. I am in favor of a less adversarial and more collaborative and forward-looking relationship between the school district and MTI. I think it is unfortunate that the union seems to perceive that it is in its best interests to portray the school district administration as hostile to teachers. I would like to see a world where the union views itself less in an adversarial role as a bulwark against the administration’s exploitation of teachers and more collaboratively as partners with the district in figuring out better ways to improve student learning. From my perspective, my proposal – which, if adopted, would only have amounted to a gesture – wasn’t intended to help persuade teachers to abandon their union. Instead, I’d hope that it may convey the message that, even when the administration and School Board disagree with teachers’ positions and adopt policies that make their jobs harder, we are not the enemy. We want to work together collaboratively in pursuit of better results for our students. A WEEK ago South Korea observed “Children’s Day“, an occasion when every school and office is closed, and the nation’s families march off in unison to chaebol-owned theme parks like Lotte World or Everland. Cynical expat residents are fond of asking “isn’t every day Children’s Day?” They mean it sarcastically but their sarcasm is itself ironic. In reality the other 364 days of the year are very tough for Korean youngsters. Results of a survey released last week by the Institute for Social Development Studies at Seoul’s Yonsei University show that Korean teenagers are by far the unhappiest in the OECD. This is the result of society’s relentless focus on education–or rather, exam results. The average child attends not only regular school, but also a series of hagwons, private after-school “academies” that cram English, maths, and proficiency in the “respectable” musical instruments, ie piano and violin, into tired children’s heads. Almost 9% of children are forced to attend such places even later than 11pm, despite tuitions between 10pm and 5am being illegal. Psychologists blame this culture for all manner of ills, from poor social skills to the nation’s unacceptably high rate of youth suicide, which is now the leading cause of death among those aged 15-24. Recently, a spate of suicides at KAIST, a technology-focused university, has drawn national attention. For most students the pinnacle of stress is reached somewhat earlier, in the third year of high school. This is the year in which the suneung (university entrance exam) is taken. Tragic reactions to the stress it creates are all too common. Budget/Financing, Events, Governance/Board Decision Making, History - Madison Schools, School Climate, Staff Support, Student Support, Teacher Support, Waste, What Can I Do? It’s ironic and hypocritical that a national radio ad expresses support for Teacher Appreciation Week and touts teachers so soon after over 1,700 Madison teachers didn’t show up for work — 84 of them turning in fraudulent sick notes. The teachers used students as pawns at protest marches and contributed to protester damage at our Capitol. In the minds of many property taxpayers and even some students, teachers have lost much respect and trust. This could be reversed if teachers and their arrogant union boss John Matthews would express in a public statement regret for their selfish and illegal actions. For generations, Wisconsin has taken pride in the opportunities we offer children through our public schools. When students or schools are struggling, we work together to find solutions. Wisconsin is at the top when it comes to ACT and Advanced Placement scores and graduation rates, and just last month, significant gains on test scores were reported along with a narrowing of achievement gaps between minority groups. That’s a foundation that should be built upon, not dismantled. Gov. Scott Walker’s education plan included in his state budget proposal will move our students and state backward. Whether you have children in a public school or not, whether you are Democrat, Republican or somewhere in between, children are counting on the state to do what’s right. Public education must remain a top priority. For months, Wisconsinites have been telling their legislators that we believe there is a better way – a balanced way – to respond to tough fiscal times without throwing away our tradition of high-quality public education. Linda Copas of Plainfield pointed out to the Joint Finance Committee that in her small school district, the number of students who live in poverty has more than doubled, but the governor’s education plan ignores that. Kim Schroeder, a Milwaukee teacher, said his students are losing opportunities such as gym, art and music. I’ve read Dr. Seuss’ “Oh, the Places You’ll Go” quite a bit over the past few weeks as I visited schools in Milwaukee, Green Bay and Stevens Point to read to second- and third-graders and meet with teachers and school officials. I’ve been visiting schools to promote our Read to Lead Task Force, which is finding ways to make sure all Wisconsin students can read before they complete the third grade. As a parent with two boys in public schools, it has been great to see the passion our teachers have for showing children how education can take them to amazing places. Like the teachers I met, I believe strongly in the power of education to open new worlds of opportunity, break the cycle of poverty and empower those searching for hope with a sense of purpose and self-determination. All too often, people focus on the negatives in our education system. We are trying to focus on our strengths – particularly in reading – and then replicate that success in every classroom across our state. The Madison School District is under added pressure to improve how it identifies and educates talented and gifted students after state officials found its program does not comply with state law. In revealing shortcomings in the district’s offerings for talented and gifted (TAG) students, the Department of Public Instruction challenges the approach some schools, particularly West High School, have used in which all students learn together. Developing a comprehensive system to identify TAG students — including testing and staff training — can be expensive, Trone said. Moreover, districts that don’t identify students from all socioeconomic and cultural backgrounds open themselves up to discrimination lawsuits, she said. Superintendent Dan Nerad said it’s unclear how much such a revamped program will cost. Much more on the talented & gifted complaint, here. Two-thirds of Madison teachers participated in at least one day of a coordinated four-day absence in February to protest Gov. Scott Walker’s proposal to curb collective bargaining, according to information released by the school district Friday. According to the district, 1,769 out of 2,655 teachers took time off during the four days without a legitimate excuse. The records also show 84 teachers submitted fraudulent sick notes; 38 received suspensions for failing to rescind the notes by April 15, a deadline set by the district. The exact number of teachers who caused school to shut down on Feb. 16-18 and 21 was unknown until now. The numbers “validate our decision to close our schools,” Superintendent Dan Nerad said in a statement. Madison Teachers Inc. Executive Director John Matthews acknowledged Feb. 15 that the union was encouraging members to call in sick to attend protests at the Capitol. It was the union’s first coordinated work stoppage since 1,900 out of 2,300 teachers called in sick to protest contract negotiations in September 1997. Voters overwhelmingly believe that taxpayers are not getting a good return on what they spend on public education, and just one-in-three voters think spending more will make a difference. Thirty-four percent (34%) voters believe student performance will improve if more money is spent on funding for schools and educations programs. A plurality (41%) disagrees and thinks that increased spending will not lead to improve student performance. Twenty-five percent (25%) aren’t sure. The survey also found that voters tend to underestimate how much is spent on education. Thirty-nine percent (39%) say the average per student expenditure is less than $9,000 per year while only 12% think it’s higher than that. Nine percent (9%) estimate the right amount but a plurality of 40% is not sure. There is a wide range of expenditure on education depending upon the state and region. Background information- On March 24,2011, MMSD received DPI’s initial findings in the matter ofthe TAG complaint. DPI found MMSD to be noncompliant on all four counts. The Board has forty-five days from the date of receipt ofthe initial findings to petition the state superintendent for a public hearing. If the Board does not request such a hearing, the findings will become final. Once the findings are final, regardless of whether a hearing is held, if there is a finding of noncompliance, the state superintendent may develop with the Board a plan for compliance. The plan must contain a time line for achievement of compliance that cannot exceed ninety days. An extension of the time period may be requested if extenuating or mitigating circumstances exist. Current Status: Currently, DPI has made an initial finding of noncompliance against MMSD. While the Board is entitled to request a public hearing on the issue of compliance, the administration does not recommend this course of action. Consequently, at this time, the administration is working toward the development ofa response to DPI’s findings, which will focus on remedial steps to insure compliance. Proposal: Staff are working on a response to the preliminary findings which we will present to the Board when completed. It is the administration’s hope that this response will serve as the foundation to the compliance plan that will be developed once the DPI findings are final. The response will include input from the TAG Advisory Committee, the District’s TAG professionals — our Coordinator and staff. A meeting to begin work one the proposed response is currently scheduled for April28, 2011 from 4:00 p.m.-5:00pm. Subsequent meetings will follow. Much more on the Wisconsin DPI Parent Talented & Gifted complaint. Watch Monday evening’s Madison School Board discussion of the DPI Talented & Gifted complaint, here (starts at 128:37). and here. Budget/Financing, Elections, Governance/Board Decision Making, Lifelong Learning, Parenting, School Climate, Staff Support, Student Support, Teacher Support, Waste, What Can I Do? California voters want government employees to give up some retirement benefits to help ease the state’s financial problems, favoring a cap on pensions and a later age for collecting them, according to a new poll. Trying to plug a $3.8 million budget gap, the York Suburban School District, in the rolling hills of southern Pennsylvania, is seeking to raise property taxes by 1.4%. No way, says Nick Pandelidis, founder of the York Suburban Citizens for Responsible Government, a tea-party offshoot, of the plan that would boost the tax on a median-priced home of $157,685 by $44 a year to $3,225. Fresh from victories on the national stage last year, many local tea-party activist groups took their passion for limited government and less spending back to their hometowns, and to showdowns with teacher unions over pay in some cases. Now, amid school-board elections and local budgeting, they are starting to see results–and resistance. Higher Spending and Lower Scores: From 2000 to 2009, spending per student (in constant dollars) increased from $11,413 to $15,291 – a 34% increase. Meanwhile 11th grade PSSA reading proficiency remained steady at 71% while math fell from 69% to 62%. This means 29% of students are below acceptable reading levels and 38% are not proficient in math! The York Suburban experience mirrors the national trend where increased spending in the public education system has not resulted in improved student outcomes. One by one, the children trooped to our table and put their apples in front of my son. By the fourth apple, I asked Christopher–my date for “Lunch with Your Second Grader” at the local elementary school in Kinnelon, N.J.–what was going on. I’m the mother of two boys, now middle-schoolers, one a good eater and one who would live on pizza and root beer if I let him. Christopher eats apples, and Nicholas leaves his on the lunch tray. He’s the one who needs his chocolate milk. Yes, chocolate. And so it was disturbing to hear about the recent chocolate milk ban in the Fairfax County, Va., school system and elsewhere around the country. Ditching chocolate milk to cut down on our children’s sugar intake might be the right sentiment, but it’s the wrong solution. The Hudson school board will suspend dozens of employees whose absences during public worker protests in Madison, Wis., caused district schools to close Feb. 18. About 40 employees of the Hudson school district, mostly teachers, will be disciplined. Punishment ranges from one to 15 days of unpaid suspension, according to the district. The length of suspension is based on “the district’s investigation into the actions believed to have been taken by each employee,” said district communications specialist Tracy Habisch-Ahlin in an email. The suspensions are to be served by the end of this school year. A split in teachers’ opinions over appropriate responses to an explosive state collective bargaining law resonates through disciplinary records released by the Oshkosh school district last week. The records obtained by The Northwestern include forms signed by 86 employees who admitted they called in sick on Feb. 17 and 18 to join protests in Madison as well as a discipline settlement with teachers’ union president Len Herricks, who incorrectly told staff members that district administration would condone calling in sick to attend the protests. Comments hand-written by educators on many of the records show a range of regret, defiance and confusion felt by rank-and-file employees caught in a whirlwind of political rhetoric and polarization.